All three of the above erosional marks are found in association with other marks interpreted to be meltwater forms: potholes, furrows, troughs, transverse troughs, stoss-side-troughs, rat tails (Shaw & Sharpe, 1987; Murray, 1988; Shaw, 1988; Sharpe & Shaw, 1989; Kor et al., 1991; Shaw, 1996; Sawagaki & Harikawi, 1997; Gilbert, 2000; Shaw, 2002). These forms are illustrated in the classification of Kor et al. (1991) and their morphology can be readily related to flow structures in turbulent and separated fluids (Shaw, 1996). 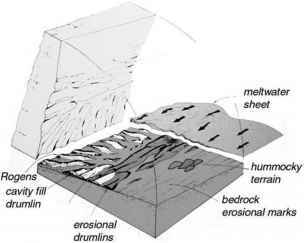 Some details of rock surfaces further support meltwater formation. Wherever s-forms are pristine and unweath-ered, rock surfaces are highly polished by abrasion. Scanning electron microscopy (SEM) images of the surfaces indicate that detrital particles of fine silt and clay size were detached by abrasion.